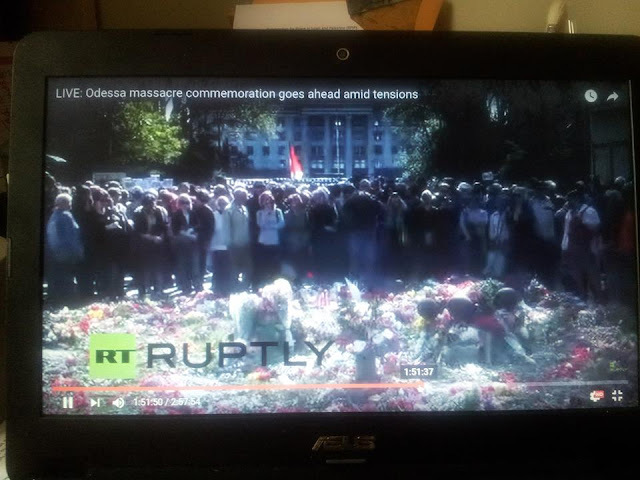 Many feared that there would be more violence in Odessa, Ukraine yesterday similar to what took well over 50 lives on May 2, 2014. But in fact the day was peaceful when up to 10,000 people gathered near the Trades Union Hall to place flowers and stand with the Mothers Committee in a make shift memorial. The public was blocked from having direct contact with the Trades Hall by huge numbers of local police, national security services and fully armed neo-Nazi Azov battalion members who have been incorporated into the newly formed 'National Guard' in Ukraine (equipped and trained by US Special Forces troops at a base in western Ukraine). The morning began with a surprise outside our hotel window when we noticed that six buses full of Army personnel were using the spot as a staging area for the day's events. After breakfast we joined a group of international alternative media people who were taken on a walk through this beautiful city to a park where another right-wing group Right Sector (Pravy Sector) was holding a small protest. They chanted some of their usual nationalist slogans but were nearly out numbered by the media people filming their every move. We next walked to the Trades Union Hall and as we approached I was overwhelmed by the huge numbers of people holding flowers heading toward the now sacred site. But we couldn't actually get onto what is known as Kulikovo Square that fronts the Trades Hall. The entire area was sealed off and behind the plastic crime scene string of red tape were heavily armed Azov battalion members. The irony is that the neo-Nazis were now guarding the very grounds were those of their political ideology had committed the unpunished crimes of May 2, 2014. The people, including the mothers of the dead, were not allowed to lay their flowers at the scene of the crime. Instead what turned out to be several thousand people crowded into a tight space with the Trades Hall looming just a couple hundreds yards away - close but ever so far away. The people were solemn and Regis Tremblay and I took the time to do some interviews with various people we met in the crowd including one man named Alexander who told the story of being at the Trades Hall on May 2 while three of his friends were killed. Two died from smoke inhalation inside the burning building and one, who jumped from a first-floor window, was beaten to death with bats by neo-Nazis who had set the building on fire and were picking people off as they tried to escape. We were taken back to the hotel for an amazing lunch. Just before entering the banquet room a gaggle of what appeared to be politicians came up the stairs to the second floor and made a grand entrance. We learned they were EU politicians who proceeded to go around the room and shake everyone's hand. They didn't appear to be very interested in speaking to any of us and once we entered the luncheon we noticed one large empty table that had apparently been reserved for the EU group. But, we later learned, they didn't want to be too closely associated with all of us - maybe they featured they might piss off the US government. As we passed thru this line I saw people weeping and they began chanting and we soon came upon a make shift alter full of flowers and candles. The now famous Trades Hall loomed in the near background. A banner was held up with the photos of those killed and various mothers were handed the microphone to share some words. One woman's emotion struck me deeply and I recognized the words 'fascist' and at the end 'nyet, nyet, nyet'. They released a bunch of white doves that flew towards the hall and then black balloons were set off into the clear blue sky. We were actually astounded that the three of us from the US (Phil Wilayto, Regis Tremblay and myself) were ever allowed to enter Ukraine. Four people from France, two from Germany and 10 EU parliament members were denied entry to Ukraine in recent days. Yesterday in the huge crowds we saw people holding signs saying they came from Italy, France, Germany, Switzerland, Netherlands, and Israel - in all we heard that people came from more than a dozen countries. Bless you, Bruce & Regis, for being there to shed light on the crimes committed in Odessa. Love to you guys. Be safe.